[SatNews] The ISDLA-1 satellite, which is one of two passengers for Arianespace’s next Ariane 5 flight, has been delivered to the Spaceport’s Final Assembly Building, marking a new step toward this mission’s payload integration. 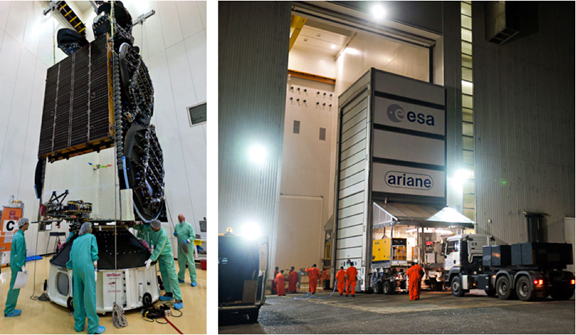 ISDLA-1 made initial contact with launcher hardware during activity in the Spaceport’s S3B clean room facility (photo at left), and subsequently was transferred to Ariane 5’s Final Assembly Building for mating with the heavy-lift vehicle (right). ISDLA-—built by SSL (Space Systems/Loral) for two long-time Arianespace customers, DIRECTV and Intelsat—was transported this week from the Spaceport’s S3B clean room facility, where the high-power relay spacecraft underwent pre-flight checkout and received its onboard propellant. 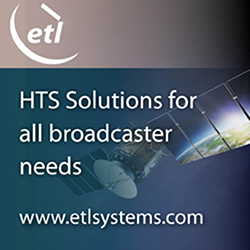 Contracted to provide service for a minimum of 15 years after its Ariane 5 launch, ISDLA-1 will greatly expand direct-to-home entertainment offerings in Latin America, as well as provide backup and restoration services. It is to operate from an orbital position of 95 degress West, co-located with Intelsat’s Galaxy 3C spacecraft. ISDLA-1 will be joined on the Ariane 5 launch vehicle by ARSAT-1, the first geostationary satellite built in Argentina, which is to deliver a wide range of telecommunications, data transmission, telephone and television services across Argentina, Chile, Uruguay and Paraguay. It was produced by the company INVAP for operator ARSAT (Empresa Argentina de Soluciones Satelitales Sociedad Anonima), with Airbus Defence and Space and Thales Alenia Space serving as leading equipment suppliers. The upcoming Ariane 5 mission, designated VA220 in Arianespace’s launcher family numbering system, is scheduled for an October 16th liftoff from the Spaceport in French Guiana. Follow Arianespace's launch activity at: http://www.arianespace.com.